Forest Peak, California. Fourth of July. Sheriff Danielle Adelman, a troubled war veteran, thinks she has all the problems she can handle in this all-American town after her kid sister runs away from home. But when a disease-stricken horde of panicked refugees fleeing the fall of Los Angeles swarms her small mountain community, Danny realizes her problems have only just begun—starting with what might very well be the end of the world. Danny thought she had seen humanity at its worst in war-torn Iraq, but nothing could prepare her for the remorseless struggle to survive in a dying world being overrun by the reanimated dead and men turned monster. Obsessed with finding her missing sister against all odds, Danny’s epic and dangerous journey across the California desert will challenge her spirit . . . and bring her to the precipice of sanity itself. . . .
Sheriff Danielle Adelman is one tough lady. Her younger sister runs away from home with Danny’s vintage Mustang, she suffers the physical and psychological effects from being a soldier in the Iraq war, she deals with petty criminals, and if that’s not bad enough, zombies are moving into her small California town. No wonder she drowns out her troubles with alcohol. With her sister’s letter in her shirt pocket and a small band of survivors, Danny is on a mission to find her sister and keep her people safe. I loved Danny’s strength and sense of ethics, and the very different personalities she has to deal with. There’s Wulf, another hard-bitten war veteran whose shooting skills come in handy, there’s Patrick, gay TV personality who feels faint at the sight of blood and has a soft spot for Danny, and Amy, the veterinarian who prefers animals to people. Then there’s the private militia group who makes everyone’s life miserable and is as scary as the zombies. The zombies get more terrifying as the story moves along. First, they are mindless, shambling creatures who moan at the sight of living prey. Then they gradually evolve into fast-moving predators that are more adept at getting through doors and windows, and then they form packs who stalk their prey. It seems that bio-terrorism caused the zombie epidemic, though the author thankfully did not spend a lot of time dwelling on the cause. What I wanted was lots of action, believable flawed characters who have to learn to work together in order to survive, and scary zombies. What I didn’t expect was the gut-punch ending. 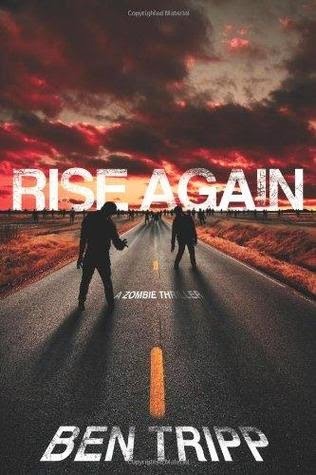 If you’re a fan of zombies, and don’t mind a story that takes occasional digs at the government and private enterprise, then don’t miss this one.